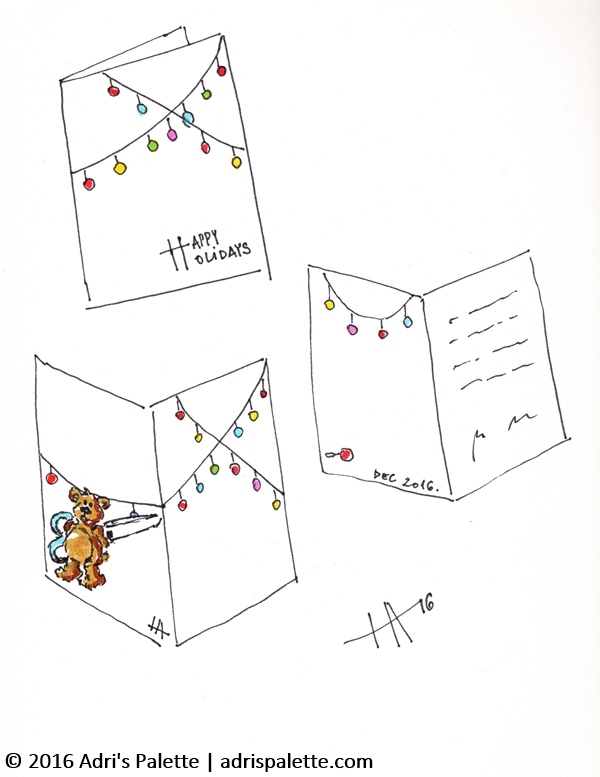 Last Christmas was the first in many years when we sent greeting cards to our friends and family. It was a mixture of the postal service not working properly, me taking an offense at them and generally being too stubborn (OK and a bit lazy) to write greeting cards. But last year, when I made them myself (if you missed it, here is the post) I had so much fun that I decided I’ll do one this year as well. This time around I wanted to do something different than last year. As I was gathering ideas I kept bumping into something, adult coloring. Whether in the form of a book, calendar, place mats or greeting cards, they are everywhere! So I thought, why not embrace this trend, and make something that is unique, but would provide the recipient with the opportunity to color a bit for Christmas. This is how this design was born. 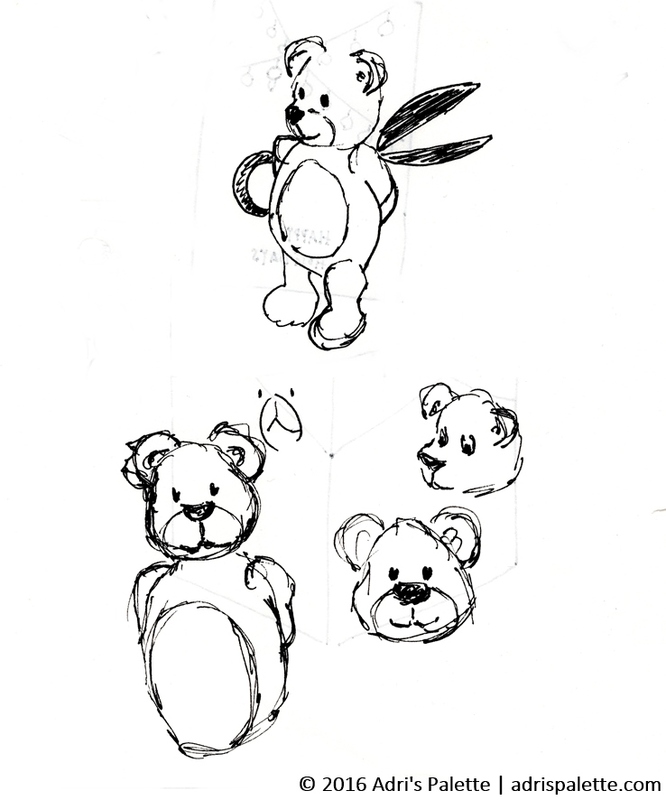 I started with designing a little teddy bear. Playful and furry, but all so serious with a pair of scissors. 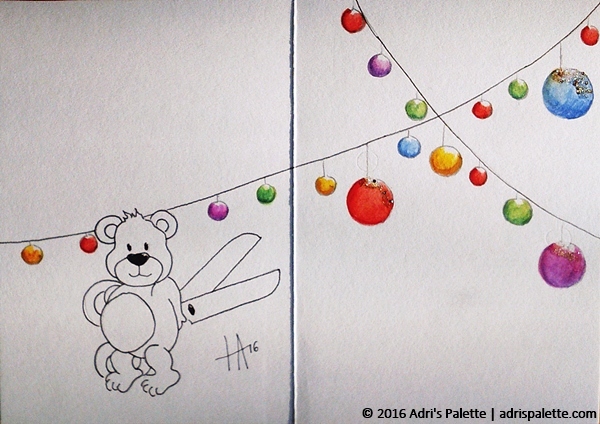 It occurred to me to have the bear design on the back of the card and decorate the front with Christmas lights. Since I decided to made the cards by hand I had to think of some method to replicate the bear design. As I wanted them to be exactly the same, I could not draw them freehand. So it occurred to me that I could make a DIY light table at home. I used our coffee table which is made out of glass. I taped the original design on the glass, put one of our reading lamps right under it, turned the light towards the paper and voilà! I had a light table all ready to use. 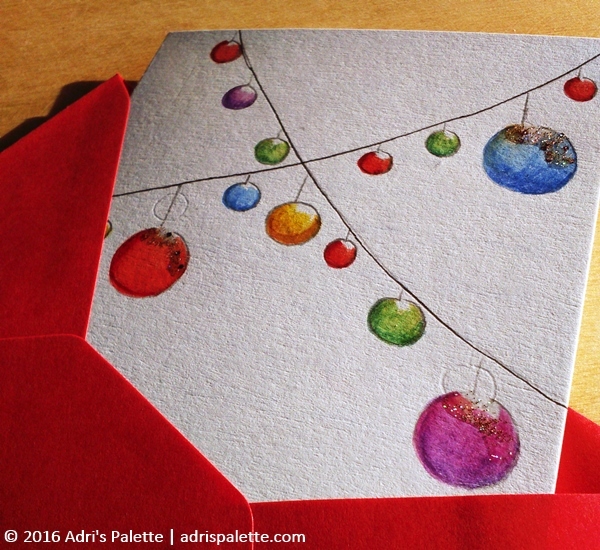 The Christmas greeting card’s final design and color scheme. The light bulbs were first painted on with watercolor. I than enhanced their color with colored pencil and used watercolor pens to further play with the lights and shadows. And Teddy… well, he is all ready for coloring! 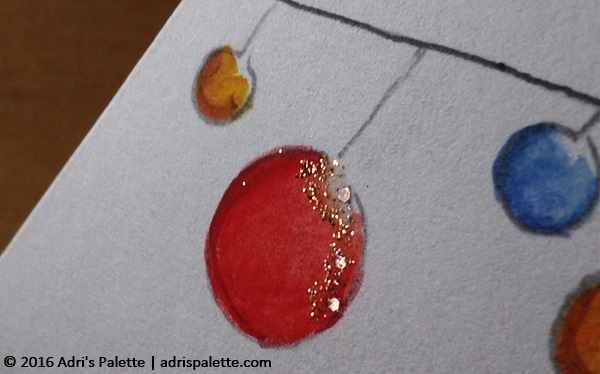 Since it’s Christmas a little sparkle cannot hurt! 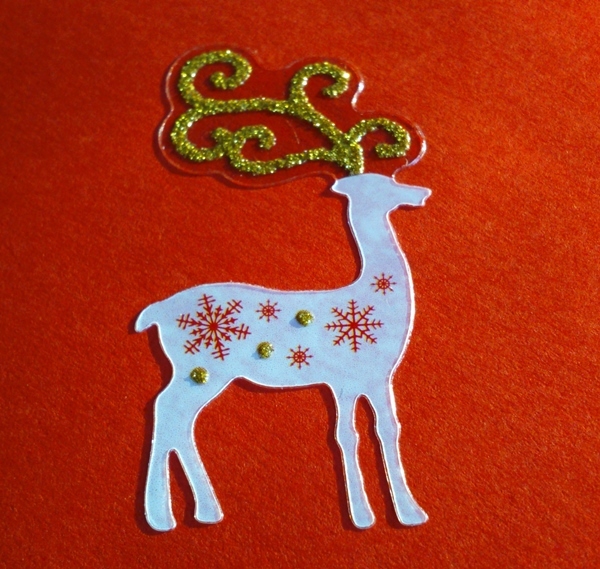 The card in its bright envelope ready to be posted. This Santa’s little elf (a.k.a. Mr. AP) kept complaining that the decorative stickers I bought for the envelopes are too flashy. By the second envelope, however, he was more into them then yours truly! If you yourself are into coloring, and like my design, then you’ll find a PDF version of it on my Printables page. Open it, download it and get coloring! And at the end another little surprise. I wanted to do a little giveaway for you, my readers. Since around this time of the year in many cultures it is a custom to give presents to one another, I wanted to take this opportunity to give a little present to you. I wanted to give back to all of you who have been supporting me on my little blogging journey. I will be giving away three of the original cards I have made to three lucky readers. All you have to do in order to win one is to write a comment to this post, or on my Instagram. The contest is open worldwide and ends December 24th, 2016, when I’ll randomly select three winners whom I’ll contact directly. Good luck! Isn’t it?! I love them also.